These offers are free with the purchase of the Hercules Roadeo NFS Pro (2016) Bicycle. The Hercules Roadeo NFS Pro 2016 is an urban MTB for teenage boys. This bicycle comes with MTB Dual shox steel frame that is mechanically formed and TIG Welded with super low geometry. The Roadeo NFS Pro 2016 comes with a 21 speed gear system. The front derailleurs are Shimano TZ, 3 Speed, and a Shimano TX, 7 Speed for the rear derailleur. The shifters on the bicycle are Shimano EZ Fire 3 Speed and 7 Speed units. The brakes on this MTB are mechanical discs in the front, and Alloy ïVÍ brake in the rear. The Hercules Roadeo NFS Pro comes only with front suspensions. It is made of thread less Alloy stem with an MTB Fork integration, providing a responsive suspension system. The wheel size of this bike is 26". The tires on the Roadeo NFS Pro are 26 * 2.15 MTB treads. These are fitted on to Alloy rims (30mm deep profile). The Price of the Hercules Roadeo NFS Pro (2016) is Rs.12500. 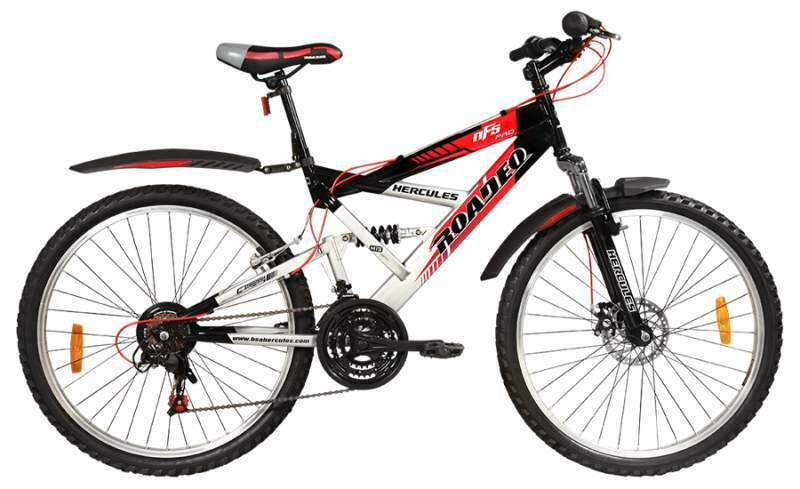 The Hercules Roadeo NFS Pro 2016 is a good option for teenage boys looking for a full suspension MTB for urban commuting. The Bicycle also comes with Front discs and a trendy frame and decals. 2. In what condition will I get the Hercules Roadeo NFS Pro (2016)? 6. How will I know if Hercules Roadeo NFS Pro (2016) will fit me without riding it? 7. How long will it take for me to receive the Hercules Roadeo NFS Pro (2016)?